The main component of a point of sale system is the CPU, or computer, that runs the software. It may have a standard operating system running the machine or it may come loaded with proprietary software from the POS software vendor. It is wise to use your POS computer for only sales transactions, reports, and inventory control. This means you should resist the urge to use your point of sale system for any Internet activities. An essential part of a POS system is the cash drawer. Money, credit card receipts, and other paperwork ​are stored here. This piece of hardware receives a signal from the computer or receipt printer and opens when necessary. If purchasing the components of the POS system separately, be sure the cash drawer is compatible with the rest of the system. Cash drawers should be sturdy and withstand the constant opening and closing. One optional part of a point of sale system is the customer display or pole display. A lighted display for the customer to view transaction totals, amount tendered and some customer displays feature customized messages or can show advertising. A retailer has many choices of the point of sale monitors to add to their POS system. Flat-panel LCD monitors may cost a little more than the standard CRT monitor, but the LCD display will take up less space at the checkout counter. Depending on the type of business, retailers may find a display allowing users to interact with the computer, or touch screens, easier and faster to use than traditional keyboards and monitors. Not only does the touch functionality replace the keyboard and mouse, it also saves counter space. If electing to go with a point of sale system without a touch screen, the keyboard will serve as a primary interface to the POS system. Keyboards for a point of sale system can vary in complexity and technology. They range in choices from a standard 101-key model like you may have on your home PC to industry-specific POS keyboards. Grocery stores and restaurants may need special functions that only programmable keyboards can provide. When selecting a keyboard, consider the size, programmable key requirements, and magnetic stripe reader functionality. Most everyone has seen a point of sale scanner at some point in their life. They can vary in size and technology. The most common may be the small hand-held scanner, which works well for small retailers. 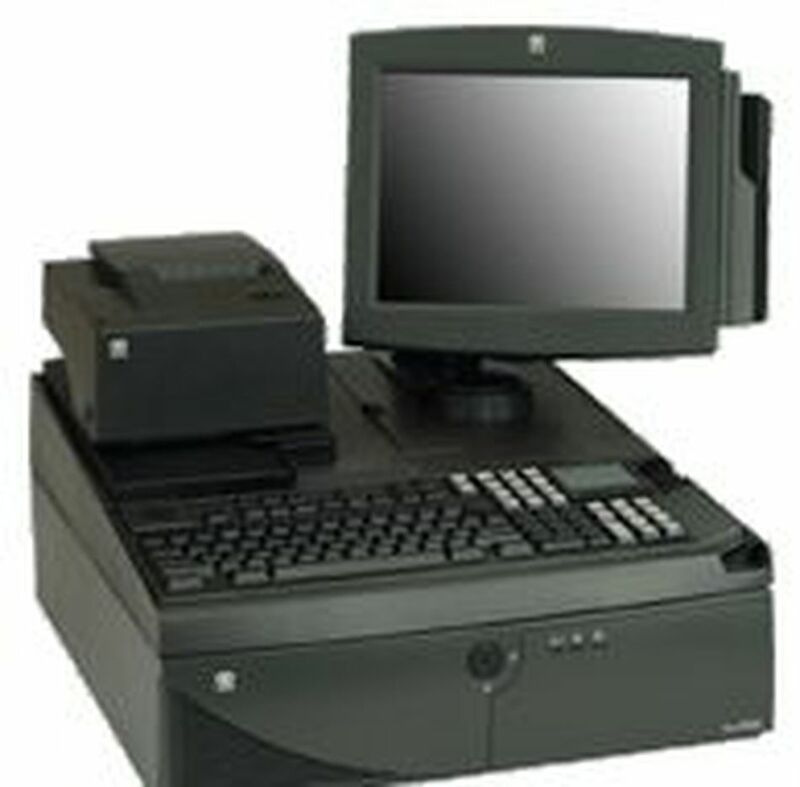 Larger stores with heavy check-out activity may want to install an embedded scanner like the ones seen in supermarkets. The way a barcode scanner works is, the scanner reads a series of numbers and lines (the barcode), deciphers the information, and sends that information to the computer. Not only are barcode scanners accurate, time-saving devices when ringing up multiple products for a customer, they also serve as a handy tool to add inventory to the POS software's database. Credit card terminals may be integrated or added to the point of sale system. Some devices include credit card readers, but if the monitor or keyboard comes with a magnetic strip reader then all that is needed is a pin pad or other way to capture the customer's signature. Besides credit and debit cards, signature capture devices can work with gift cards and other loyalty programs. These devices help streamline transactions and reduce the costs (and errors) associated with deposit paperwork. The final item to tie together the POS system is the receipt printer. The ability to print a record of the transaction for the customer, and possibly the store, is critical. Serial dot-matrix printers are generally cheaper to purchase initially, but this type of printer uses pins and ink ribbons which add to the cost over the lifespan of the receipt printer. Thermal receipt printers cost more initially but use special paper which also adds to the lifetime expense. However, the thermal printer is also faster and quieter. Some receipt printers include a check reader which uses Magnetic Ink Character Recognition (MICR) to describe the numbers and symbols that appear at the bottom of checks. This type of printer can read, print and then endorse a check in a single pass. Whichever style and model of cash register receipt printer you choose, be sure you have plenty of the correct related supplies on hand, such as receipt paper or printer ink and ribbons. If integrating with an existing point of sale system, be sure to have the proper cables for connectivity.